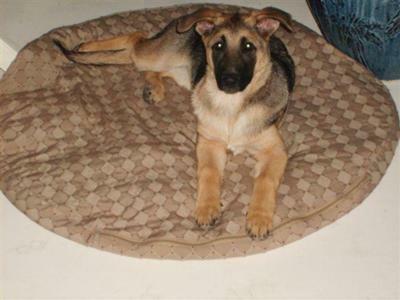 I work at a large Metropolitan Police Dept, it was Super Bowl Sunday, February 7th, 2010 A young lady called the station, stated I have a 12 week old full blooded German shepherd puppy with AKC papers, her name is Mia and I can’t keep her. She stated she just got her from a breeder a week ago. I paid $400.00 for her, I got her a cage, food, and her accessories, I don’t want any money for her. I have 4 kids and the youngest one in diapers. Why did you get a puppy? Because my kids wanted one and my aunt had a shepherd, she was a great dog, so I looked for a female German Shepherd puppy. I ask why she called the police dept, her response was, because they have German Shepherds. She is smart, I was hoping the police dept would keep her, she would make a good “police dog”. I can understand that logic, but our shepherds come from Europe and they are 2 years old males. I told the lady we just put our Lab, Ebony down, she was 12 1/2 yrs old. (I realized when I received this call, I just typed Ebony's name in my computer). I felt that this must be a sign from God, and maybe this is meant to be. The lady stated I can send her picture to you, I reply, can you bring her here to the station, she said, I'll be there in 20 minutes. My coworkers were so excited to see Mia. She needed a home and my husband and I can give her a wonderful life, she just turned 1 yr old,she is healthy and happy. We love her and she loves us too! Hey there, Linda. It is good to hear from you. Thanks so much for taking the time to come here and share your German Shepherd puppy stories with us all today. Love the picture too! Thanks for sending it in - both of them, the GSD story and the picture. She is in the right hands! Mia is one blessed dog to have my aunt Linda and uncle D as parents! They are such great, loving, and caring parents!! She's just precious also. I'm sure Ebony didn't like to see you guys so upset when she was looking down from doggy heaven, so she sent Mia to help you through your rough time. God made sure you were placed in the right hands. On 06-03-2007 I held my Princess (GSD) as she took her last breath. She was 17 years,11 months and 23 days old. Princess was a victim of Chinese food posioning. As a matter of fact she was on a food source that had just been removed from the shelves and was very expensive. December of the same year a fellow Officer of mine told me he wanted to get a German Shepherd. he also wanted to know that if his apartment presented a problem that he might have to get rid of the dog. I told him just go ahead and get the dog and we will worry about the other problem if it came to be. Sure enough he had to get rid of the dog and he asked me to come get it. I did. when i seen him with the dog I thought he was kidding. Jake, the GSD was beautiful. To make a long story short I must tell you that Princess passing on was hard to take. We took Jake to the Vet. Another Vet in upstate Delaware sent Jake's paperwork down to our Vet. My wife picked up the paperwork to sign it and just stared at the paperwork. You see, Jake was born on 06-03-2007.The Lord works in strange ways.